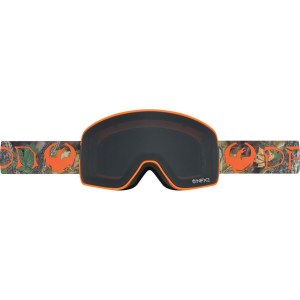 The Dragon Danny Davis NXF2 Goggle may not give you the smooth and effortless riding style of Danny Davis, but they will give you the optics you need to spot landings like a hawk, as well as the anti-fog performance you need to make the most of a pow day. This pro-model version of the NXF2 houses all the features you'll find on Dragon's high-end goggles, like cylindrical lenses, an anti-fog coating, and an interchangeable lens system, which are all brought together in a medium-fit package that keeps your peripheral vision perfect without making you look like you're launching a mission to Mars. If you pair the NXF2 with your favorite lid, you'll avoid gaper gap thanks to Dragon's helmet-compatible design, and you can forget about that annoying itching feeling you get around the eyes, too, because these specs seal around your mug with triple-layer face foam that has a hypoallergenic micro fleece lining. Proposition 65 Warning for California Consumers: This product contains chemicals known to the State of California to cause cancer and/or birth defects or other reproductive harm.